A video of a white woman calling the police about a black family’s BBQ has turned into a meme called “BBQ Becky”. 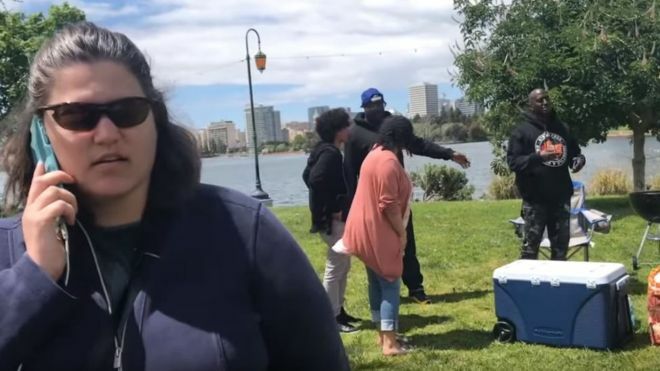 The original video, posted on YouTube, shows a confrontation over a barbecue in a park in California. The woman has been accused of being racist, but insisted that having a charcoal grill in the park is illegal and that’s why she was complaining. She has now been Photoshopped into black history moments including Martin Luther King’s I Have a Dream speech. Black Panther even made an appearance. The original video was filmed in Oakland, California and was posted on 29 April. The woman phoning the police is seen and heard insisting that having a charcoal grill in that area of the park is illegal. The woman calling the police, still with her phone to her ear, says “it has nothing to do with their race”. The video continues and the situation gets more heated. The woman who complains to the police is seen sobbing when the police arrive. We also hear from the BBQ-owner who says: “I was minding my own business, I’ve been here for 42 years”. The police can be seen talking to both parties at the end of the 25-minute video. Since hitting the internet, the video has given way to many memes as well as igniting conversations about racism on Twitter.